ozonepete wrote: Oh, no, wait. There's misunderstanding going on here. 1. Guiuan is 40 miles south of the center so I'm not sure that's "well south" since the "eye" was very large at that time, and we still have no data on how large the eye (or central calm area) was. If it was 30 or 40 miles across than Guiuan may have been in the eyewall. The typhoon made landfall by 9:15 p.m. near the town of Dolores on eastern Samar Island, Philippine government forecasters said. The storm had weakened somewhat as it approached land, with maximum sustained winds of 108 miles per hour near its center on Saturday afternoon, according to the Philippine Atmospheric, Geophysical and Astronomical Services Administration. 108 mph is 90 knots and high category 2. Actually I haven't heard any weather agency at all say that it was more than a high cat 2. Does anyone know of such a statement so far? I just said that I was expecting higher wind reports and surprised that there aren't any so far. And that's why I said that no documentation is mere speculation. Just trying to get answers based on data. I'm sure we'll get some better data sooner or later. But PAGASA uses 10-min winds. 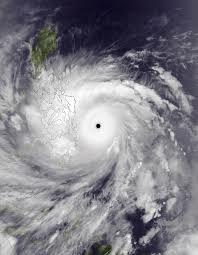 xtyphooncyclonex wrote: But in reality, it made landfall as 115 mph. Where did you get that number from my friend? What station reported 115 mph? Yes, I know. Also JMA uses 10 minute winds. Only JTWC uses 1 minute winds. But after landfall the different meteorological agencies will say what they thought the landfall intensity was, and later adjust it depending on new data that comes in. I haven't heard any official agency state over 110 mph winds since it made landfall. Just trying to find out what the current thinking is. Looks like flooding threat could be less now. Convection is really collapsing due to land interaction and really cool dry air being ingested from the northwest. Rainfall rates must be dropping considerably. That would be great news for the Philippines. Let's hope so. RL3AO wrote: Haven't kept up with the reports today. With how slow its moving, I can imagine we're looking at some impressive rainfall totals. With the collapse of the thunderstorms we probably won't see impressive totals from here on after all, thankfully. Incredible collapse. Not much convection left to speak of. But of course given how powerful it was it will still take a while for the winds to die out so everyone needs to be careful. Yeah you will be on the stronger side of Hagupit. Watch out for strong winds. Hagupit slowly weakens as it crosses the Phillippines. However, conditions still may be unfavorable for normal daily activities. Be prepared regardless. How's Cebu? Any damages, power interruptions? any magical outlook that by tom this will just be a Tropical Storm? 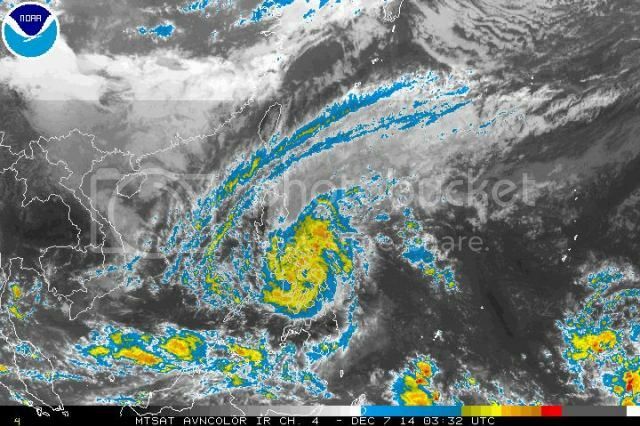 How is the cold dry air in the area of the Typhoon? THE PT IS 3.5. FT IS BASED ON PT. dhoeze wrote: any magical outlook that by tom this will just be a Tropical Storm?